Jason came to The DVS Group in June of 2015. He closed his deal with GroupSource in January 2016. 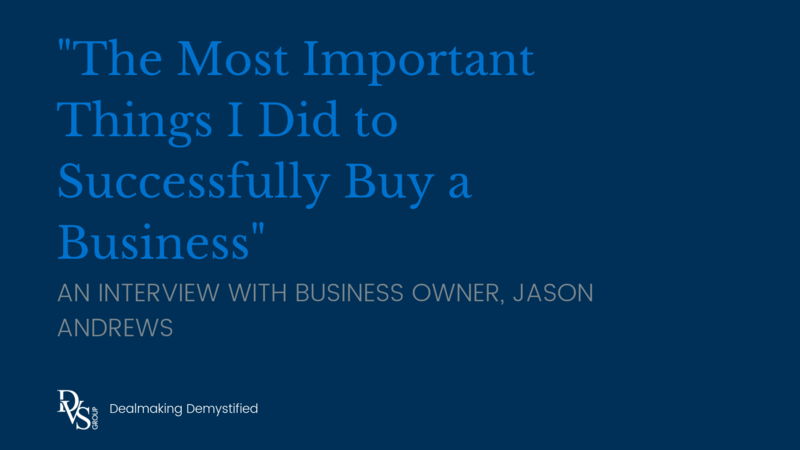 After just over a year with the new title of “Owner”, we talked with Jason about his purchase process and what ended up being vital in making it a success. Playing the numbers game was important in Jason’s search. He was willing to kiss a lot of frogs in order to find the one that transformed into the right match. The middle of September a business owner called our office in response to a letter they had received on behalf of our client, Jason Andrews. He owned a company – GroupSource. Jason was several months into the search process, had spoken with close to 30 other response companies and knew GroupSource was one to pursue. The back-and-forth communication that happens once a buyer and seller connect is a bit like dating. Each side has to be convinced of the other’s merit, their plan for the future, commitment, responsibility. And, at the core, they simply have to like each other. By following the clues, Jason knew GroupSource was the right business for him. For Jason, knowing that GroupSource was the right fit “wasn’t even half of it.” A successful close isn’t guaranteed. Are you considering buying a business? Ask these six questions to see if you’re ready. We welcome your questions and thoughts. Please reach out to us for a complimentary and confidential conversation. ← Who Does My Business Feed? A Look at the Rippling Impact of Small Business in the U.S.